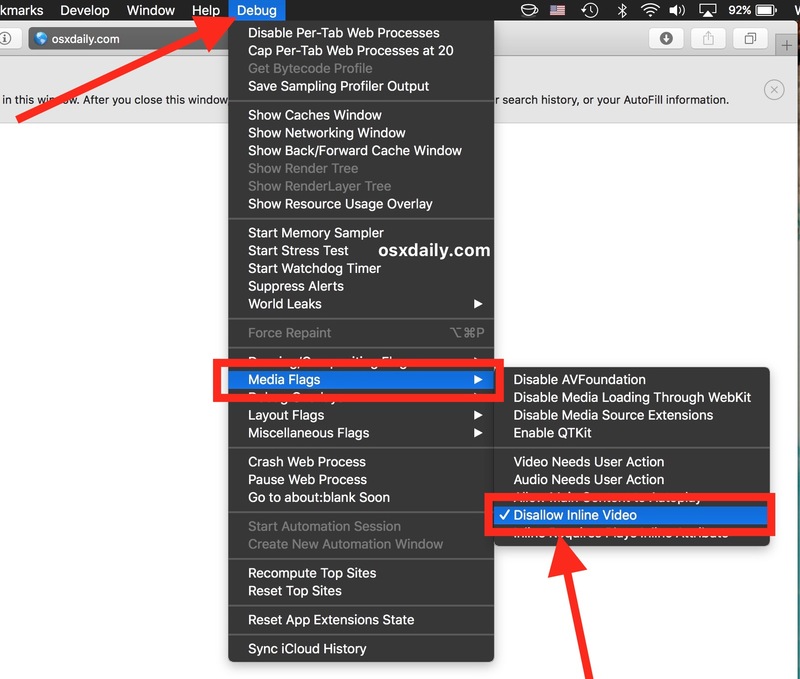 A quick important note: modern versions of Safari include a disable autoplay feature discussed here that is separate from what is detailed below. Additionally, in current versions of Safari (anything before High Sierra) if you choose to stop autoplay video then every video in Safari will require user interaction before it can be played. Typically this means you must click the video and then click the play button to start the video. 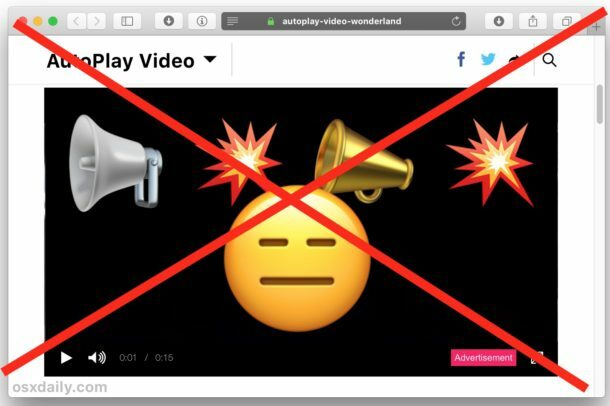 All autoplaying videos will be stopped, but so is the ability to just easily press the play button to start any video – instead it will be a two-step play process required to play video. You can try out the setting below and see if it works for you, if not then it’s just as easy to disable and go back to the default options of allowing autoplay and inline video again. * Safari 11 in macOS Sierra and MacOS High Sierra 10.13 onward includes an easier to access auto-play video disabling ability. Thus, this tip is most relevant to earlier versions of MacOS and earlier releases of Safari. I’m having an issue with cpu activity spiking like mad when I go to some sites that seem to have a lot of auto loading things, mostly news sites. Will this take care of that problem? It might, usually CPU spikes on web page load are due to things like video, flash, java, embedded widgets for polls and chat, full page takeover ads, animation, interactive features, etc. Try it out, it could make a difference. Changing ‘false’ to ‘true’ would reverse thereby enabling inline video again. Setting the “Video Needs User Action” flag from the same menu works for me. Well this didn’t work. I followed the directions then I clicked on the sample website in the article which has an auto play video on it … and … it auto played just fine. Any clues as to what I might have done wrong? I was able to stop all autoplay video with inline video but I ended up choosing “Video Requires User Action” instead, which simply puts a play button on all videos rather than disabling them. Try that Ann. Both work for me, make sure you’re doing it properly. I like to use Safari Technology Preview. I’ve tried substituting that title in these Terminal commands but no workee. Any suggestions? Worked for me. Looks like those annoying advert vids have disappeared. Question: Stops video from autoplaying, but will it still download the entire video in the background / cache ?? How do I then make the debug menu disappear from Safari? Thanks Paul – works great but now when I do play a video, regardless of site, it opens in full screen. Can’t figure out how to play the video inline at it’s normal inline size. I believe that I read somewhere that High Sierra can or will turn off auto-play videos on websites. Very happy to hear that. I find it very difficult to read an article with a video playing right along side it. In the meantime, many thanks for the info about how to disable auto-play in previous versions of the os. Hello Paul, I have the same issue as R. Taylor with video opening in full screen. I found this after searching for a fix for graphics card issues with 2010 MBP and large videos on some websites and 360 photos on Facebook crash my machine. gfxCardStatus mostly stops the switching of cards but the occasional videos still cause problems. Thank you, thank you, thank you for this greatly appreciated tip since we can no longer get away from the constant streaming of marketing crappola. I do not see this sub menu at all. What version of Safari is this? Great news! The brand-new latest version of Safari — 11.0 (12604.1.38.1.7) — which I just downloaded on Wednesday, Septemober 20th — finally fixes the problem. No more autoplay! The update has caused a website that I visit (with ads) to stop functioning. Sierra 10.12.6. I don’t see a debug menu in Terminal. How do I reverse/undo the stop auto-play? Fixed it! 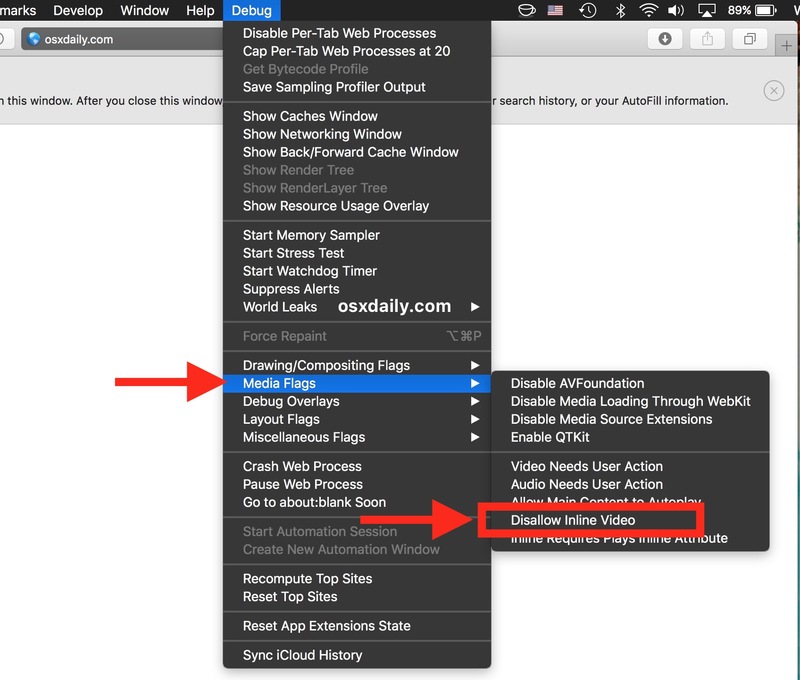 Safari –> “Settings for this website” –> select auto-play preference for the website. I thought there was a preference setting within Safari to turn on the debug menu. No terminal needed at all! Whoops! Mine is the developer menu; which I suppose is different! I’ll have to explore this. Those auto playing videos are the pits! Don’t their promoters realize how irritating they are. MacWorld is one of the worst and they, of all people, should know better!